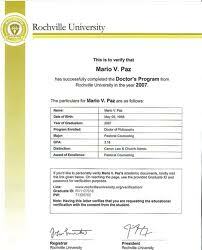 I have an accredited degree from Rochville through study and some life experience. My accridation is signed and noterized by Hillary Clinton. I have no problem contacting them at any time” my degree is recognized anywhere. Are you sure there aren’t more than one Rockville ? Hah am I literally the first reply to this awesome post?! Phony degrees are not just disturbing but also it’s a wake-up call for us to understand some people would take desperate but dishonest measures to pay their way to get a degree (so much for genuine grads having to work their heads off getting theirs through merit and hardwork really). It’s happening everywhere. @whatsaysyou: Very nice response. Thanks for reading. ^^You are welcome, Antonio, and you’re not the only one feeling concerned about this matter. My blog on http://whatsaysyou.wordpress.com also highlights the issue of people lying about their so-called qualifications just to enter university, get a job or have something to brag about when they shouldn’t have done so. I’m Dr.Samai Hemman DBA.in Global Management at Rochville University USA.2010 I’m love Rochville University . Name some of the courses that you actually took from Rochville University. Name some of the professors you had while at Rochville University. Can you provide some syllabi from Rochville University? Did you receive your DBA through all life experience credits? Do you know that Rochville University is accredited by a non-existent body? Thanks for reading and your response. That’s a lie. If you want someone to believe you, then cite evidence to prove your claim. Report it as a fraudulent charge to your bank account. Sorry to hear that. It’s important for you to file this as fraud with your bank. I am a graduate of Rochville through study and some life experience. I have no problem contacting them at yay time. My degree is signed and notarized by Hillary Clinton and is fully accreidated. Are you sure there aren’t two Rochville University’s ? Hi, I lost a great job with the juvenile dept. because i used my so called degree from rockville, which turn out to be nothing. if their was a way to sue these people I would be amoung the first in line. Not only did it cost me a good job but now i dont trust any online schools. I have been unemployed for 3 years now because law enforcement wont hire me and I am too old to try a real college. If you want the truth email me at jamesspoon29305@gmail.com I will help you save your money. James, I have conducted extensive research on Rochville University since 2009 at the University of Wisconsin-Madison and have found that the people who created this scam of a “university” may have serious ties to terrorist activity and terrorism funding. I very much appreciate you for reading and for providing your feedback. couldn’t find at Troy University an engineering program. Please advise what should I do. I actually have a degree from rochville and did have to take some classes via internet from them and transfer credits from Henderson State University. I am shocked at what I have been hearing when I logged on tonight to get there address. I have been a working man in the HR field with it now for 3 years. I am completely shocked and do not know what to do. If your workplace is focused on you having an accredited degree, then I would highly recommend that you quickly enroll in an online program at Troy University, Capella University, Walden University or some other established universitiy that can provide you with an accredited education. Rochville University continues to scam people. I deeply regret that this phony universitiy has scammed you out of your money. This is a completely fake post. Rochville has never offered a class in the life of the “school.” They are nothing more than a sham. Contact The Googasian Firm, P.C., by calling 1-877-540-8333; they can help you with this situation. Additionally, file a complaint with the Better Business Bureau too. I hate that this has happened to you. From my research, the individuals responsible for this fake university have terrorist connections. I received my HS diploma and associates degree from Rochville because due to unseen circumstances I got myself pregnant junior year of HS. I was able to complete highschool up to Nov. my senior year but then had to drop out. Does this mean that my HS diploma is not real and I have to get a GED? I was in a vocational school for HS so also received my Associates in Early Childhood Education and am very frustrated after reading this post and feel like I am at a complete loss. Any suggestions would be amazing! Thank you!!! Unfortunately, your high school diploma and Associate’s degrees are fakes. Rochville University is not a real school. The creators of Rochville University are scamming people out of their money. I am engaged in research and have found that many organizations do not check out the credentials of Rochville University and accept diplomas and degrees from this scam of a “university.” Troy University will accept Rochville University’s “credentials,” so I suggest enrolling in Troy University online while you can get an undergraduate degree, using the diploma and degree you purchased from Rochville University while you still may have a chance. I hate to bring this news to you but you and many others have been robbed by the creators of Rochville University. I paid for my HS diploma tons of money because I couldnt get my originals back in Argentina…… I was trying to enroll in EMT class at FAU in Florida when I found out it was a scam……….. Just Plain Scam…. This is very unfortunate. You are one of many people who have been victimized by the people responsible for creating this phony “institution.” Share this article so that others will not fall prey to the same fate. I’m doing all I can to get the word out and plan to do more. I am deeply concerned at what these sharks have scooped too. My business is centred around ethics. I received a Doctorate in Wildlife Management from Rochville. I specialise in the development I have just got an email stating they have accreditation form the US Educational Department!!! I have 45 years in conservation related matters here in South Africa. Where, and how do I apply now for an authentic degree on the basis of previous learning experience? I received a call saying my degree is valid on the basis of previous learning (apostile!!!?) & to check with my government! Very confusing to say the least! I hate to be the bearer of unfortunate news, but you cannot get a valid degree by receiving your degree through life experience only or even mostly through life experience. Now, you can receive a valid degree through “prior learning credits.” “Prior learning credits,” however, are obtained by taking assessments, presenting portfolios, and etc. For prior learning credits, you may want to look at Thomas Edison College online. The individuals behind this scam of an “institution” are robbing and tricking so many people into giving them their money in exchange for diplomas and degrees that are not valid. If you need more help, I’m more than willing to offer you the assistance. Rochville University is a scam. It’s not a real university. It was created by individuals in their home with terrorist connections who are scamming people out of their money. You can never buy a degree that will be valid; therefore, do not waste your money on buying a degree. There are, of course, a number of institutions that you can attend completely online and receive a valid degree: Troy University, Argosy University, Liberty University, Columbia Southern University, and etc. Thank you for reading and your response. If you need more information or help, just let me know. what about this process they call Attestation with the US State Department Seal on it etc? Yes, Rochville University has been verified by U.S. agencies as a scam with probable terrorist associations. It’s not recognized by any official accrediting agencies. No one should be fooled out of his or her time and money by Rochville University. I have even engaged in academic research on Rochville University and have found it to be a scam. Mayfield University is a scam. You need to ask for your money back or file a fraud claim with your bank to get your money back. Mayfield University is not a real university. Mayfield University is a scam ran by a few people sitting behind in computer screen in their own homes. Antonio, you seeem to know all the scams. Is this how you spend all of your time ? I will have to admit, that I fell for this scam. They furnished me with boards of accreditation through more than one Board. I more or less was lead to an understanding, that I had quite enough life experiance to apply toward my degree. What a dope I was. They just started sending e-mail to try to rub it in with a bogus government attestation for X-amount of dollars. I called the number they left, and of course before I could finish, they would not answer my questions, and hang up. Anyway to force a response ? Thanks for being my sounding post. Any options left open? I suggest that you involve a governmental agency or agencies in this matter and legal counsel as a way of getting back any financial losses you have incurred as a result of this scam. This is truly an unfortunate situation. I am working to bring down this fake operation known as “Rochville University. ” I suggest you get a lawyer involved to make an attempt to recover your financial losses. Those responsible for Rochville University have committed fraud, which can entitle you to recover lost damages. I’m sorry to inform you, but Rochville University is a scam. You’re going to need to get a lawyer involved to attempt to recover your financial losses. You’re going to need to explain to your company what has happened. You will need to let them know you thought you were getting a legitimate degree. I hope that you will be able to work things out, and you may want to go ahead and register with an established online degree program at Troy University, Argosy University, Walden University, Capella University, or etc. I have my certificate in Bsc in computer information Technology. I’ve requested for my credential for the past two yrs but no responses. My company need my credentials from Rochville university. What should i do? Check my previous response to your first comment and let me know if you need more information. Take the work hours from your employer and find a CEU. in all of the courses of review and pass the required credentialing test. Show them that you have your BSc. It’s not illegal to be issued educated that is not accredited. However. You do have the right to followup with an official collage and take the CEU. with an credentialing board of study to pass their test. Can you prove that Mansfield is a scam? Sure. Go to The Council of Higher Education Accreditation’s website and type in this school and you will not find it. This fake “school” has told me and others that we can simply pay for our PhDs without taking any classes, which further indicates this is a scam. It’s unaccredited and the fake accrediting agencies are not listed with The Council of Higher Education Accreditation. Don’t waste your money unless you work for them. Can you tell us more about this? I’d love to find out morde details. Specifically, what additional details would you like to know? Rochville University is fake. It’s not even an institution. I just want to add. No matter what degree you get in the U.S. You do have education rights to maintain accredited studies. However, all whom have received their Rochville Graduate papers. Have the option to follow it up with an accredited college and enroll in CEU courses. Not all online colleges are fake. You really need your employer to back up your work experience and if awarded an life experience degree. Any court will want to know how have you maintained your academic position. Find out the career path the accredited university, the credentialing board, and pay to take the courses. Get a couple of CEU as well. As long as you attend an accredited program to follow up where you left off or to advance your current education. It’s all about money. Accredited Education is not cheap. Serve your position awarded and just keep advancing. Good luck…. Is a rochville university degree recognized? Rochville is an accredited online university which means that the degrees awarded by Rochville are accepted in all US States and abroad. “Rochville University” is fake. If you’re looking for a real online degree, consider attending Troy University, Walden University, University of Phoenix, National University, and others. Rochville University is fake; it’s not even an institution. It’s a scam operated by some dangerous criminals. Sorry this happened to you. I encourage everyone to investigate thoroughly every online institution being considered. When you were pursuing the undergraduate degree, you didn’t consider using federal student aid? It would be at that point where this fake “institution” would be exposed. Okay. There are several different types of Accreditations Agencies. However, what you have received from Rochville is an experienced degree. The degree has to be matched with former education in advance toward your experience. It should also have been made proper with the correct official documentation for continued education. You still can get this done. Then, contact a college or program that will accept your academic background and experienced degree. it’s not fake. Sorry, Shelly, but you’re simply misinformed about this issue. “Rochville University” has been proven across the nation to be a fraud. In 2006, I ordered and received from Rochville University a high school diploma over the telephone for someone who is not even eligible for one. I’ve conducted scholarly, academic research exposing those behind this group as being connected with terrorism and other unseemly phenomena. While there are several accreditation agencies, one does not receive credit and recognition for an unaccredited diploma/degree and for attending an unaccredited institution. Also, be sure that the accreditation agency is real and accredited itself. You simply have to do your research. Our U.S. Constitution provides that NO law shall be made prohibiting such free expression regarding religious education. “There are accrediting organizations that may not be recognized but are not accreditation mills. For example, the accreditor may be seeking recognition, but the process is not complete. The problem is that government recognized accreditation is exorbitantly expensive which results in complying colleges and universities having student expenses as high as $100,000 or more, in tuition, costs and fees for a 4-year degree. This restricts many of the less financially privileged, from enrolling in the BIG colleges and universities that hold governmentally approved accreditation. However, Colleges and Universities that choose to hold accreditation from governmentally non-recognized accrediting bodies or Christian educational accountability organizations and educational ministry membership associations like IACEA, are thus enabled through financial feasibility to meet a huge need in providing education to the masses at up to 80% or even 90% in financial savings when compared with the BIG colleges and universities that hold Regional or National accreditation under approval of the government/ secretary of education/CHEA. *In addition: Public College tuition, costs and fees are averaging up to $50,000 for a 4-year degree, compared to just $2,000 to $10,000 for quality, governmental unrecognized degree programs. This represents a savings of up to 90% for public colleges and up to 98% for private colleges over the total costs of attending governmental approved (private & public) BIG colleges and universities. Non-governmentally recognized schools are those who have non-governmentally recognized accreditation. However, non-governmentally recognized college and university credits are often accepted in transfer to governmentally approved colleges and universities. The major difference between governmentally approved and non-governmentally recognized colleges and universities is that colleges and universities not recognized by the government, do not qualify for student loans. But, when a student can save up to 90% on tuition, costs and fees, there is no need for a student loan anyway.